Fix GPS Signal Not Found Error in Pokemon Game : Pokemon Go game has been receiving huge downloads and hits from all over the world. You can guess the popularity it’s in-app purchases crossed billions within a short time. Pokemon go is a completely real-world augmented game there are no buttons or joystick to control the game. if you need to move your device in order to move the character or player in the game. This made users go crazy with Pokemon Go game. Interested to see complete Gameplay of Pokemon Go. You can also complete description and tips about Pokemon Go on Wikipedia . Yet this interesting game has some flaws, Not from the developer side or with your device connectivity. If you are playing the game for the first time you might face like Failed to Detect Location of Pokemon Go, GPS signal not Found or Player or Character not moving in Pokemon Go. If you are the one facing with any of the above-mentioned issues, We have an individual guide discussing each and every issue with pokemon go game. 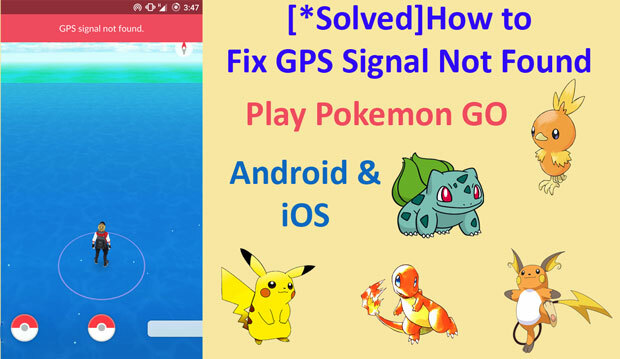 Present here we will be dealing with How to Fix or Solve GPS Signal Not Found in Pokemon Go game on iOS and Android Devices. As you all know that Pokemon Game is location based augmented game works on GPS or Location issues. So one should enable your device GPS and Locations for smooth gaming. However on doing so also some of the gamers are also seeing issues like Failed to detect to Location, GPS Signal Not Found, Player or Character not moving in Pokemon Go game. These are pretty big issues. On exploring deeper we found 3 possible methods to fix Pokemon Go Gps Signal Not found. Note: Try all the methods I may not say particular method will shower up the issue. So try all the following methods to fix the issue. Switching up to Google maps will gives you more accuracy. So if you find yourself running into this problem make sure your google maps register your location or do it manually. Now leave Google maps open and then launch pokemon go application with google maps running in the background. At max, this will resolve “GPS signal not found Error” in pokemon go game. If you device Location Services are turned off, GPS Signal will not get activated and Pokemon go game will not get Gps signal. To enable GPS on iOS and Android devices follow below steps. iOS Devices: On your iOS device navigate to Settings > Privacy > Location Services and move the top-most ‘Location Services’ toggle it to the green button. Android Devices: Go to Settings > Location and turn on the ‘Location’ toggle to green. Hit numerous times around 4-7 times to open Developer Mode. Tap on option “Mock location”. Disable it. Hope our solution fixed “Pokemon Go GPS signal not found” error. If you have any other solution or any queries regarding GPS Signal issues in pokemon go game shoot your comments in below comment box. Do you have any other issue with pokemon go game which is not available on our blog request us through comment form. Thank you.